Although the San Fernando Valley in Los Angeles is home to nearly two million people, aside from two subway stops and a bus rapid transit (BRT) corridor, the enclave maintains relatively few robust regional public transit connections. That situation is likely to change over the coming decade if a plan to build a 9.2-mile light rail transit line is implemented as recommended by a recent Los Angeles County Metro staff report. Staffers call for Metro to build the so-called Alternative 4 plan, a scheme that would stitch the Sylmar/San Fernando Metrolink Station in the northeast corner of the valley together with the Metro Orange Line BRT route on the valley’s southern edge. 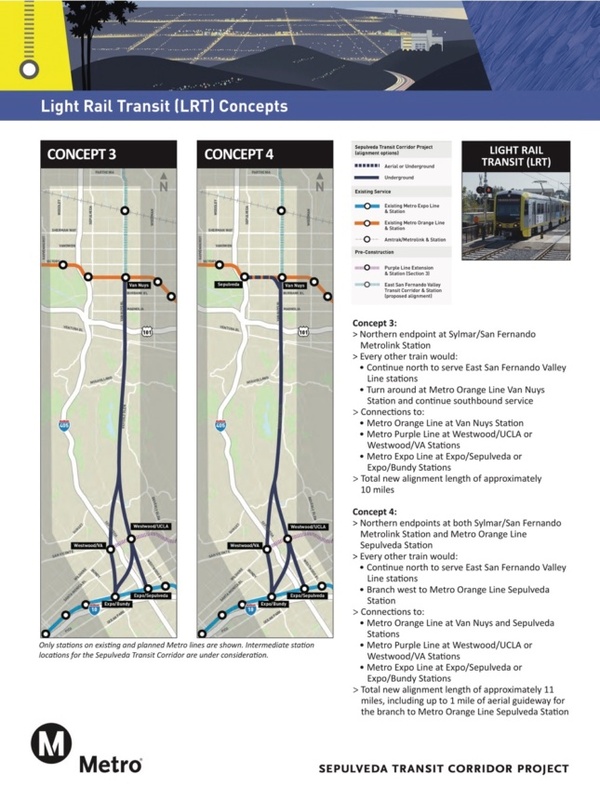 The L-shaped route would run on a 2.5-mile segment within the Metro-owned railroad right-of-way adjacent to San Fernando Road along its northern stretch with the remainder of the route running at-grade in the street median along Van Nuys Boulevard. Although perhaps best known as a 1950s-era cruising spot, Van Nuys Boulevard is now home to the second-busiest busway in the valley and also clocks in as the seventh busiest bus route system-wide. The planned light rail route would shave 30 minutes off the current travel times, with trains passing every six minutes during peak intervals. With a bit of luck, the proposed route also has the potential to definitively link the valley with the rest of Los Angeles, depending on which alignment is chosen for other forthcoming high-profile project routes. Metro is in the planning stages for the Sepulveda Pass transit project, a scheme that would bridge the mountain pass currently traversed by Interstate-405 in order to connect the valley to L.A.’s Westside neighborhoods and to Los Angeles International Airport. Metro is investigating a smattering of transit schemes for the route including heavy rail subway, light rail, and even a monorail, among other options. If the agency goes with the light rail alternative, it’s possible a one-seat ride from San Fernando to LAX might one day be a possibility. Several of the other alternatives under consideration for the line could still create the regional link, albeit with a transfer from the Van Nuys line to the Sepulveda Pass route. 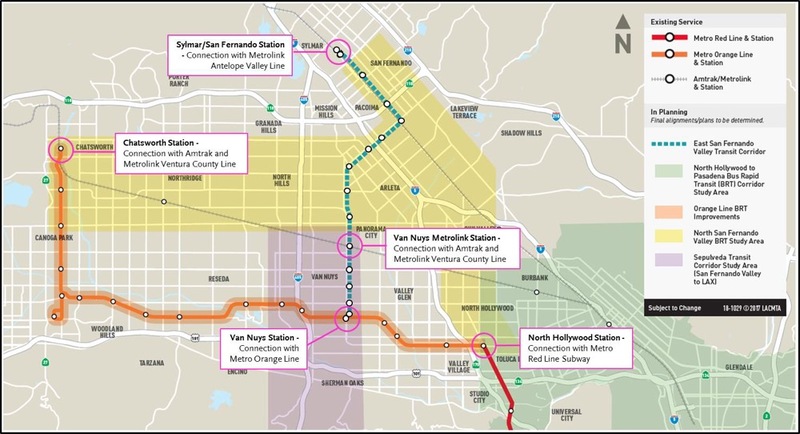 If a direct connection to the Sepulveda Pass is unavailable, the Van Nuys line also has the potential of becoming a spur off of the Orange Line—the existing BRT route in the valley—which Metro is considering converting to light rail sometime in the future. Metro has not explicitly stated this potential alignment as a possibility, but if the agency decides to pursue heavy rail or a monorail through the Sepulveda Pass, it would be an easy way to connect the route to the existing and planned transit system. Metro is also currently eyeing extending the Orange Line east through Burbank, Glendale, and Pasadena, though only as a BRT project as of now. 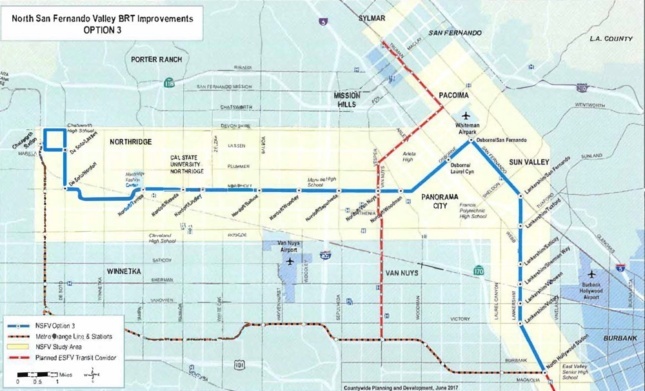 The agency is also considering a complimentary east-west BRT line through the valley along Nordhoff Street. The recommended proposal for the Van Nuys line has the potential to remake the valley, either way, as the areas surrounding the potential route are already densifying and lots of development is slated for adjacent neighborhoods. The Metro Board of Supervisors will take up the light rail recommendation on June 27th; The agency expects to begin construction on the route during fiscal year 2020-2021 with final completion due by 2027, just in time for the 2028 olympic games.